General Dynamics Advanced Information Systems (GDAIS) has completed the critical design review (CDR) of surface-mine countermeasure unmanned undersea vehicle (SMCM UUV), Knifefish, for the US Navy. Following the completion of CDR one month ahead of schedule, the GD-lead team will now start system hardware and software development and then move ahead with integration based on the approved design through fabrication of three engineering development modules. In September 2011, GD was awarded a contract to develop and deliver Knifefish UUV as part of the US Navy’s littoral combat ship (LCS) mine warfare mission package. Capable of providing enhanced mine-hunting capabilities for the US Navy personnel, the UUV is scheduled to achieve initial operational capabilities in 2017. 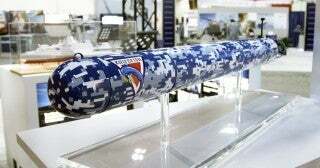 General Dynamics Advanced Information Systems president Lou Von Thaer said that Knifefish would be compatible with an open architecture platform and will ensure that the navy’s mission systems will continue to evolve to meet current and future mission requirements. "The ease of the ‘plug and play’ integration with ship systems and mission modules allows for platform flexibility and quick reconfiguration of the whole mission package in response to the dynamic requirements the fleet will encounter day to day." "The ease of the ‘plug and play’ integration with ship systems and mission modules allows for platform flexibility and quick reconfiguration of the whole mission package in response to the dynamic requirements the fleet will encounter day to day," Thaer said. The first heavyweight-class mainstream mine countermeasure (MCM) UUV, Knifefish will enable sailors to detect and identify mines in high-clutter underwater environments including those that are suspended in the ocean, resting on the sea floor, or buried. Capable of providing intelligence support by gathering environmental data for other mine warfare systems, Knifefish can be deployed with both variants of LCS through the common LCS interface control document. The GDAIS team for the Knifefish programme includes Bluefin Robotics, Ultra Electronic Ocean Systems, Oceaneering International, Metron, Applied Research Laboratory at Penn State University, 3 Phoenix, General Dynamics Information Technology and ASRC Research Technology. Image: A US Navy’s Knifefish SMCM UUV. Photo: courtesy of Bluefin Robotics Corporation.